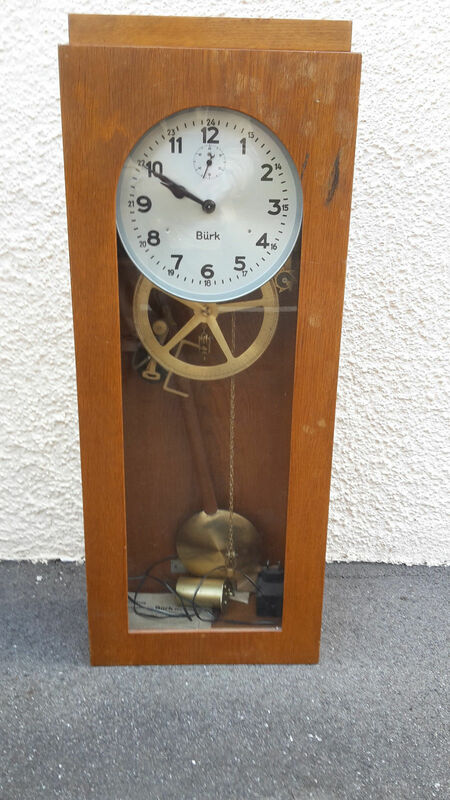 After over a year of searching for a Bürk master clock (Mutteruhr / Mutteruhren / Hauptuhren in German) at the right price, I finally found this one in apparently good condition from what I could see. 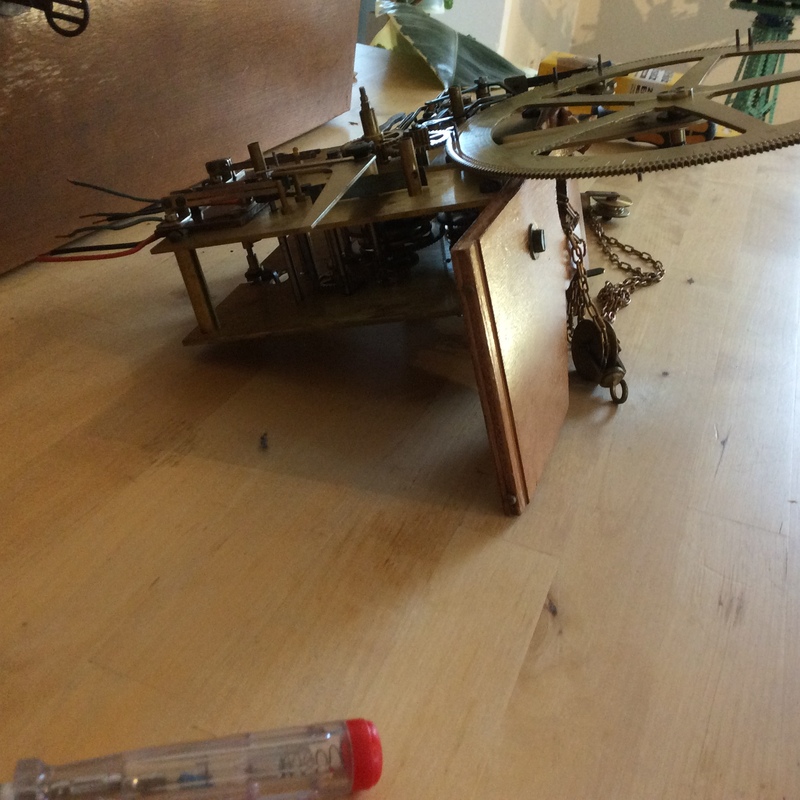 However, once I got the clock on the bench I discovered a few problems. 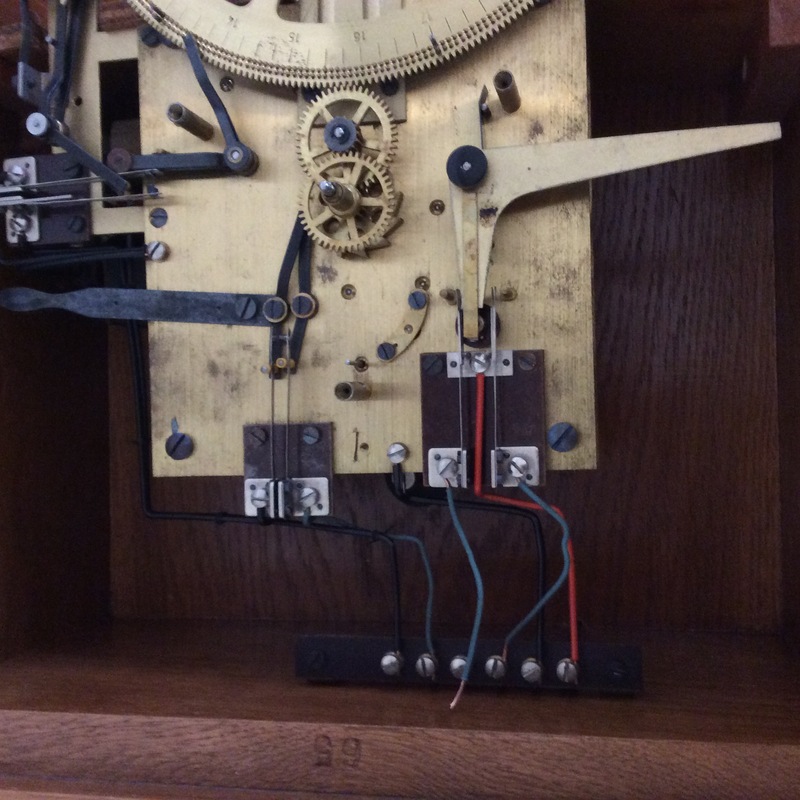 Firstly, a plywood wooden slat that holds the clock regulator (the main clock mechanism) in place had somehow been snapped and was only being held in place by two screws that secured the regulator to it. 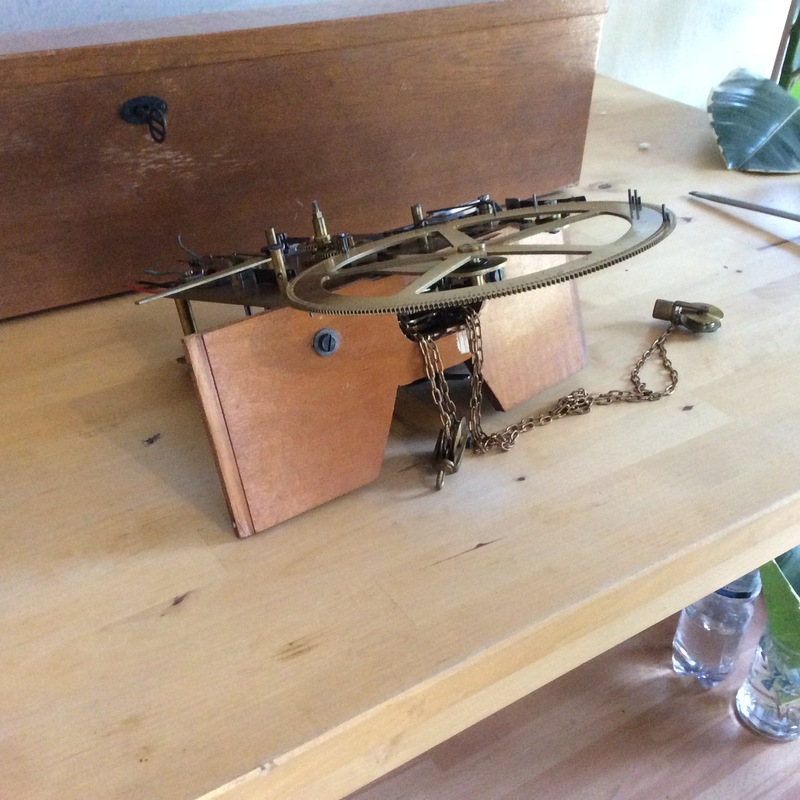 Secondly, a threaded segment that held two regulating nuts, for pendulum adjustment, had been completely snapped off preventing the pendulum bob from remaining attached to the wooden rod. Thirdly, there was a break in the inductor and capacitor connection across the motor circuit. This was fixed by soldering in some tinned wire. Lastly, the supplied 12 volt 300 ma plug pack was found to be insufficient to run the internal winding motor. 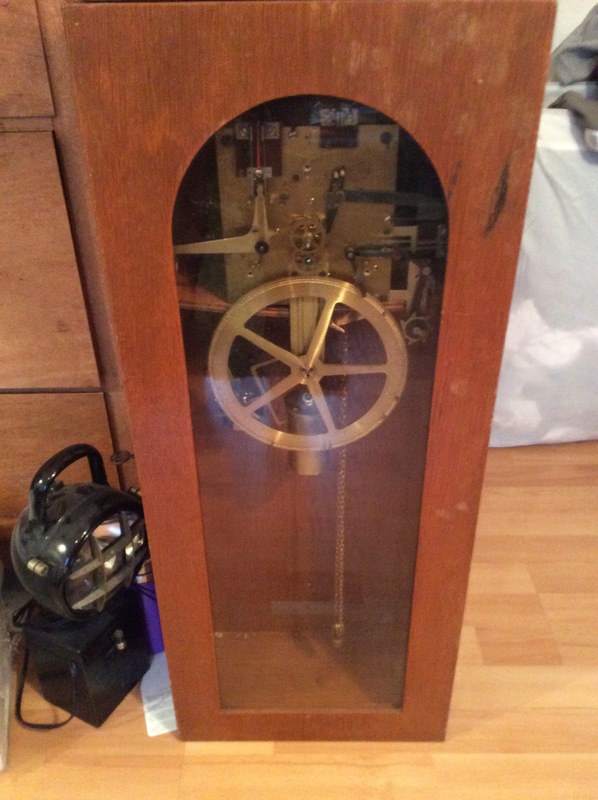 Despite the minor problems I am very happy with the condition of the clock and the price paid. You will see from the images below what I am talking about when referring to the plywood slat. 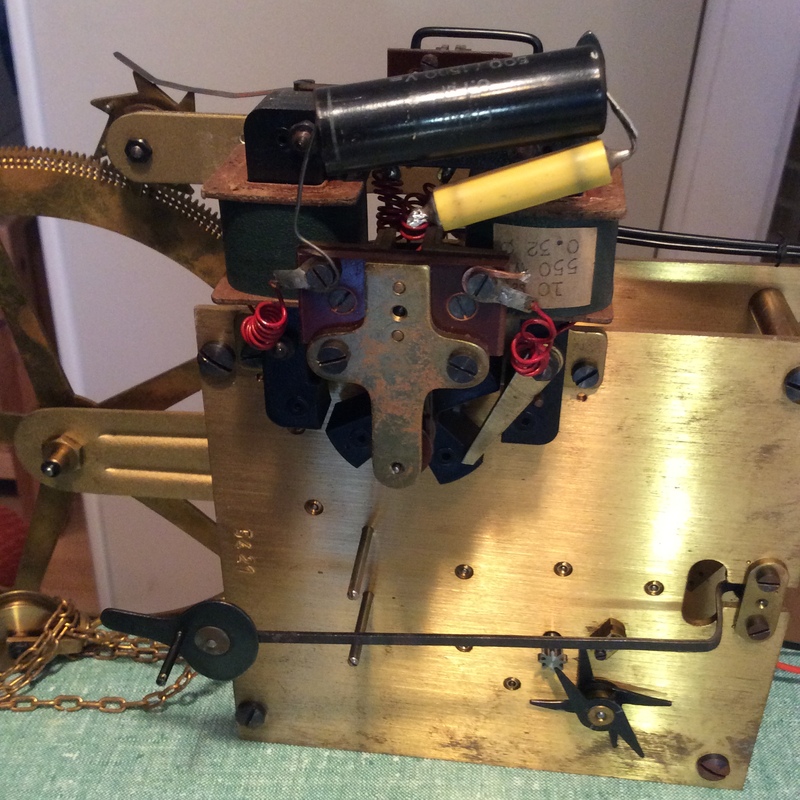 After removing the screws securing it to the regulator I found that the slat had been snapped in half. 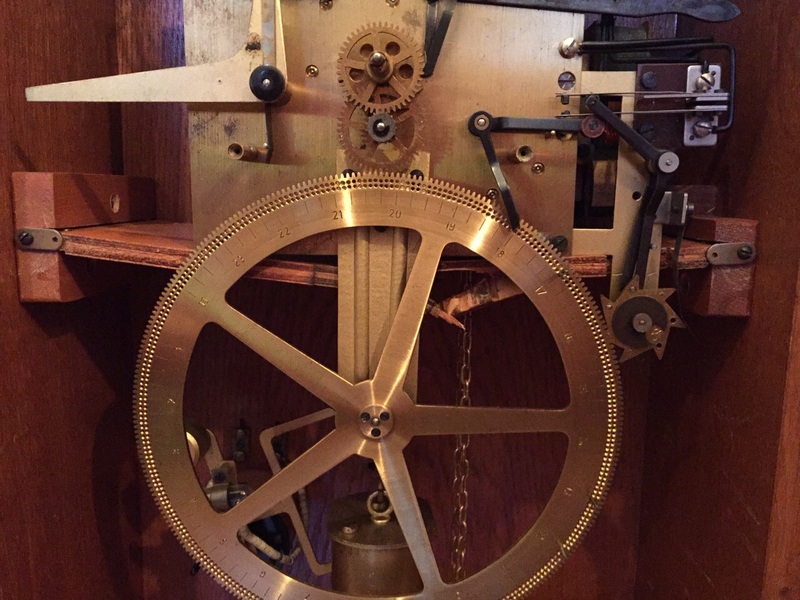 The clock must have suffered a pretty big drop for this to happen given that the brass regulator would have given the slat a good degree of mechanical support. 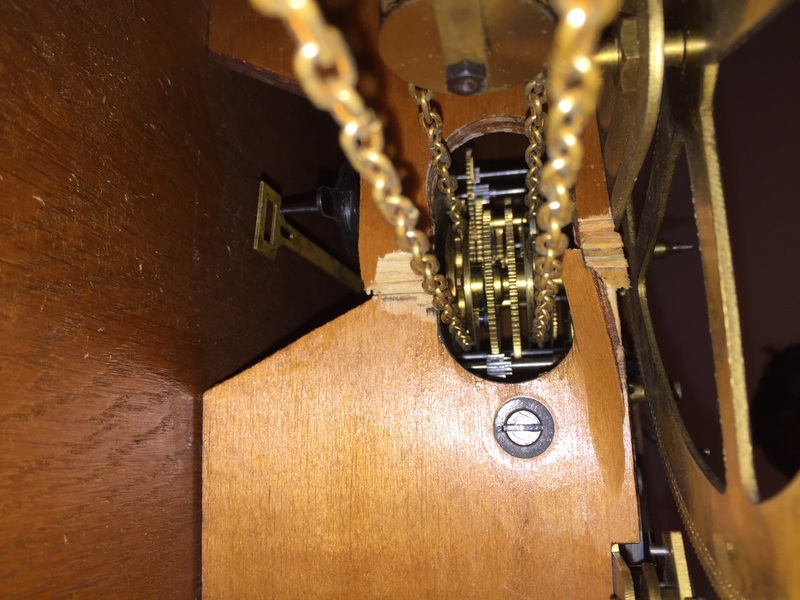 That said, the screw holes in the slat were sufficiently large as to probably allow for enough give to allow the slat to flex and snap with enough pressure from the brass clock mechanism. 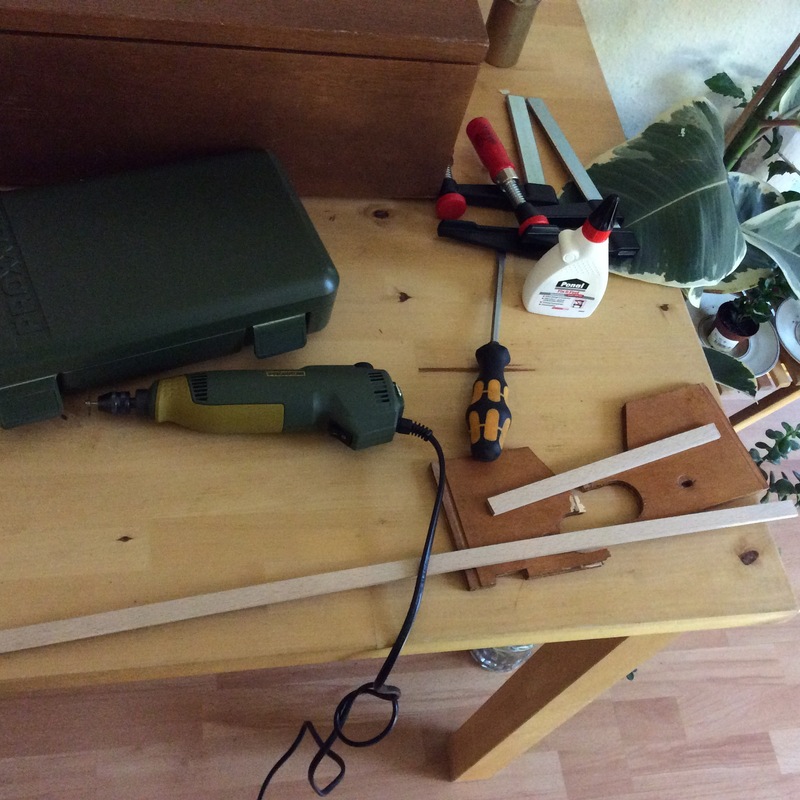 The breaks in the two pieces were filled with wood glue (Ponal Fix & Fest Holzleim) and two thin rectangular strips of Beech (Rechteckleiste Buche) were glued across the slat for extra support. 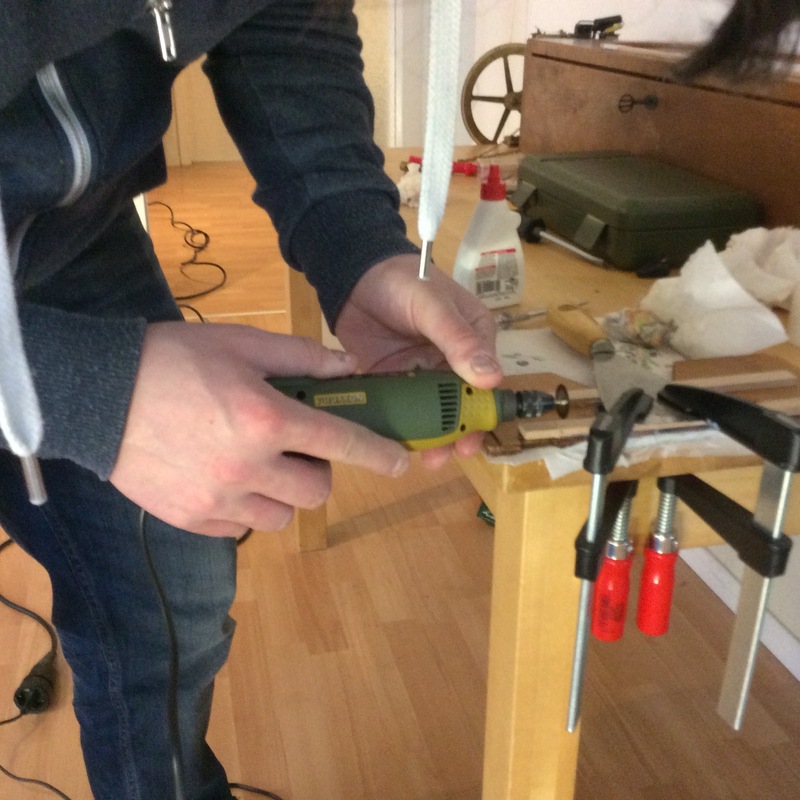 The whole thing was then clamped to the bench for 24 hours. There is a little kitchen paper that ended up glued to the slat which I shall sand off before reattaching it to the regulator. It is interesting here to note the “quality” of the wooden slat. 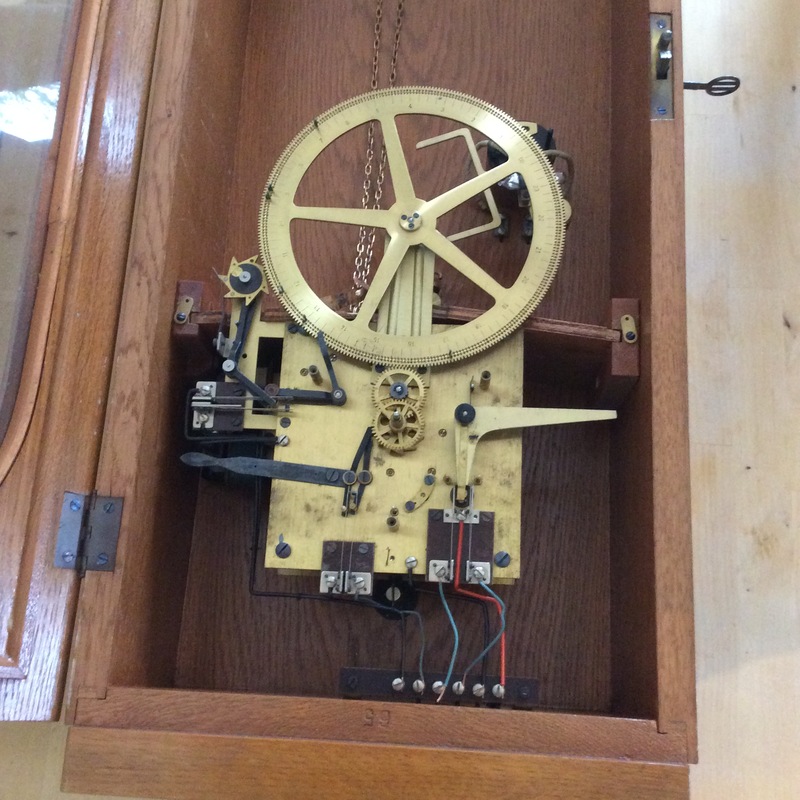 This clock was most likely used in a school so, from a commercial perspective, attention to detail when putting the internal wooden parts of this clock together was probably not a high priority. 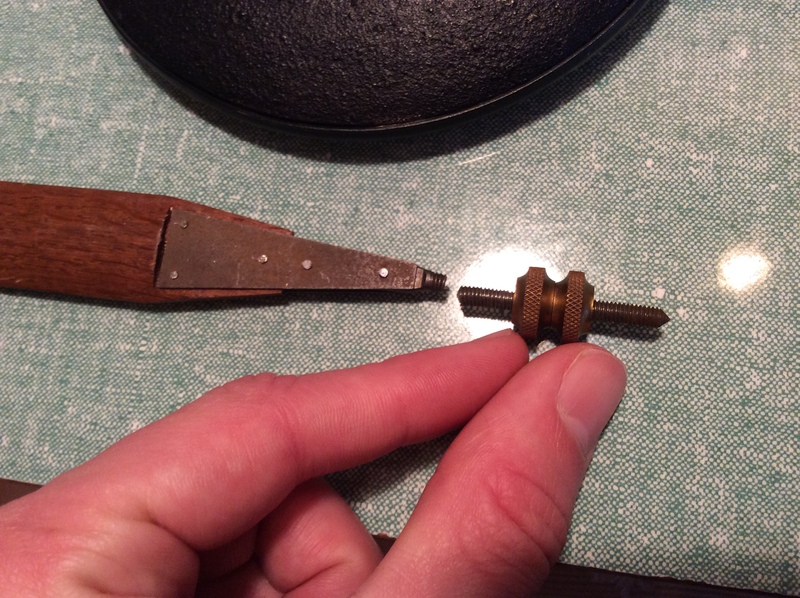 This was a little sad as I do not have the tools to fix what was effectively a snapped M4 thread screw. 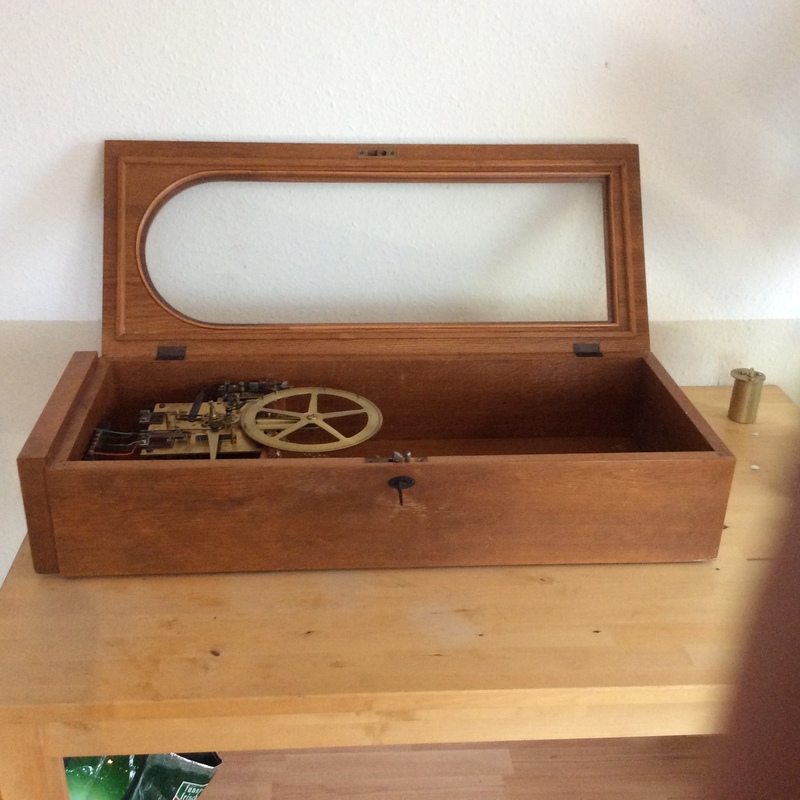 Thankfully a local clock maker (Uhrmacher) was able to replace the broken thread for €35.00 which I think is a pretty good deal given that there is at least an hours work in it. Not much to say here. I have replaced the power supply.